Located along the south shore of Rio de Janeiro, the neighborhood of Ipanema is home to one of the most popular beaches in the city. On the west side of the beach, there is a terrific view of the Dois IrmÃ£os Mountains, and Ipanema is also an ideal place to watch the sunset. Vendors can be found along the beach selling hats, beer, sunglasses, souvenirs, and almost anything else you can imagine. Beach-goers can always be found playing volleyball or football in the sand, which is can be entertaining to watch. Try your hand at surfing the waves of Ipanema, which is an increasingly popular activity all around Rio. 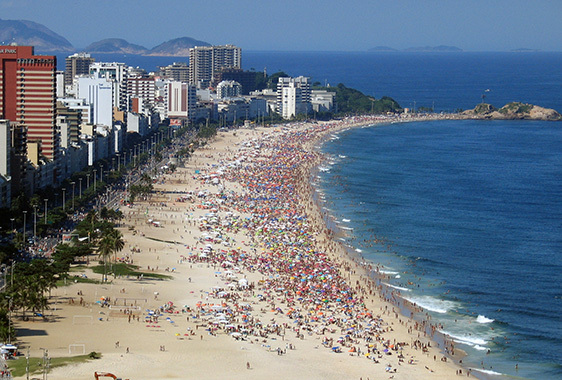 Besides the beach, there are several exciting things to do in Ipanema. For example, Feira Hippie is a weekly market full of craftsmen, sculptors, and painters, making it a great place to experience local culture. Of course, Ipanema is home to numerous top-notch, beachside hotels, so you can stay in luxury while have a remarkable view over the Atlantic Ocean. Restaurants of every type are plentiful as well, serving American favorites and traditional dishes. In Ipanema, there are endless enjoyable ways to spend your time. You will love the beauty and warmth of the beach, as well as the memorable inshore attractions. Life is truly a beach in the coastal neighborhood of Ipanema.